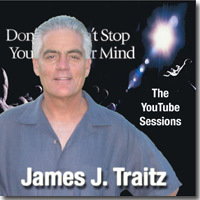 Our viral marketing campaign for Don't Stop Your Mind by James J. Traitz has already reached over 150,000 viewers and has generated so much feedback that we have produced 25 new episodes. James J. Traitz has appeared in the documentary "Consciousness Drives the Universe" next to David Lynch, Wayne Dyer, Deepak Chopra, David Wilcock, David Icke, Michael Talbot, Gregg Braden, Robert Anton Wilson, Neil Kramer, Grant Morrison, and Bill Hicks. 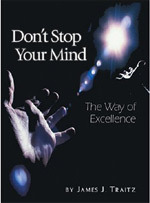 An audiobook, based on the YouTube sessions was just released on iTunes. This is part one of 36 episodes. This is part 2 of 36 episodes. This is part 3 of 38 episodes. This is part 4 of 38 episodes. This is part 5 of 38 episodes. This is part 6 of 38 episodes. This is part 7 of 38 episodes. This is part 8 of 38 episodes. The Greek philosophers understood that the mental impressions that arise in our minds are appearances and not the original reality itself. This is part 9 of 38 episodes. This is part 10 of 38 episodes. This is part 11 of 38 episodes. This is part 12 of 38 episodes. This is part 13 of 38 episodes. This is part 14 of 38 episodes. This is part 15 of 38 episodes. This is part 16 of 38 episodes. This is part 17 of 38 episodes. This is part 18 of 38 episodes. Everywhere we look we see the results of ideas that have been planted by the limitations of our current Western worldview. The public educational system teaches the most mundane learning that science can offer. This is coupled with the absence of any teaching about theÊexistence of a creator, a soul, or a spiritual dimension beyond that which is physically perceived by our 5 senses. This is part 19 of 38 episodes. This is part 20 of 38 episodes. This is part 21 of 38 episodes. This is part 22 of 38 episodes. This is part 23 of 38 episodes. This is part 24 of 38 Episodes. This is part 25 of 38 Episodes. This is part 26 of 38 Episodes. This is part 27 of 38 Episodes. This is part 28 of 38 Episodes. This is part 29 of 38 Episodes. This is part 30 of 38 Episodes. This is part 31 of 38 Episodes. This is part 32 of 38 Episodes. This is part 33 of 38 Episodes. This is part 34 of 38 episodes. This is part 35 of 38 episodes. This is part 36 of 38 episodes. This is part 37 of 38 episodes. This is part 38 of 38 episodes.